An Egyptian scarab beetle to match a customer's beloved pendant. It's sterling silver .925 and sized to fit. More of these are available. Email for additional details. The bands are made of 14kwg. Her ring is braided and his ring is simple and clean. A set like this can be made again. Please email for details. Chryosolla and pearls linked together in silver plated links and looped onto earrings. My sister n law needed a necklace to match her dress. She gave me a picture and asked me to make something similar to it. This was my answer. Lotus cultured pearls and crystals made from swarvoski's finest collection. 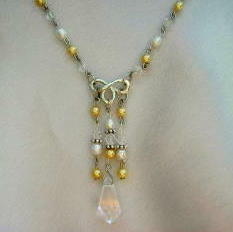 The center piece is a symbol of "infinity" that was fabricated together and linked to the necklace. I can make more like this but not exactly the same. Email for details.